With their classic, sculptured design, casement windows are perfect for a range of homes and styles, from traditional to modern look properties. All or part of the window sash opens outwards and you can choose frames for an angled look, or opt for a softer, curvier style. 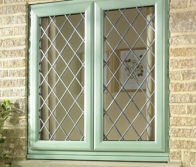 All our windows are made to measure and you can choose timber, uPVC or aluminium for the frames. White double glazed windows are a popular option but you can choose from a wide range frame colours, glass options and hardware to tailor your new windows to your property. uPVC is the most popular material for new windows due to its great value for money, high energy efficiency and low maintenance. Modern uPVC windows can last for many years without losing any of their performance benefits, keeping home interiors at a comfortable temperature. Modern aluminium windows have a thermal insert to stop heat loss through the frame. Slim and sleek, aluminium windows are a great option for any modern property and have the added benefits of strength and an extremely long life span. Timber windows are an aspirational home improvement product that particularly suits heritage properties. Contemporary timber windows are manufactured specially to prevent common problems with old timber windows, so require less frequent maintenance than before. Get the look of timber with the performance benefits of uPVC with Residence 9 windows from Balmoral. We offer windows in a variety of woodgrain finishes with traditional ironmongery accessories. We supply and install all our casement windows with high security locking options that achieve Secured by Design accreditation, approved by the police. Choose internally beaded double glazing for extra security. Our uPVC casement windows can achieve up to an A+ energy efficiency rating, while timber double glazed windows achieve up to an A rating on the BFRC scale, which exceeds the recommended rating for new windows. Tailor your new windows to your home with a variety of frame colours, glass options, astragal bars and handles.